Well-known author and sales influencer shifts business focus to bring company unique services and skill set. 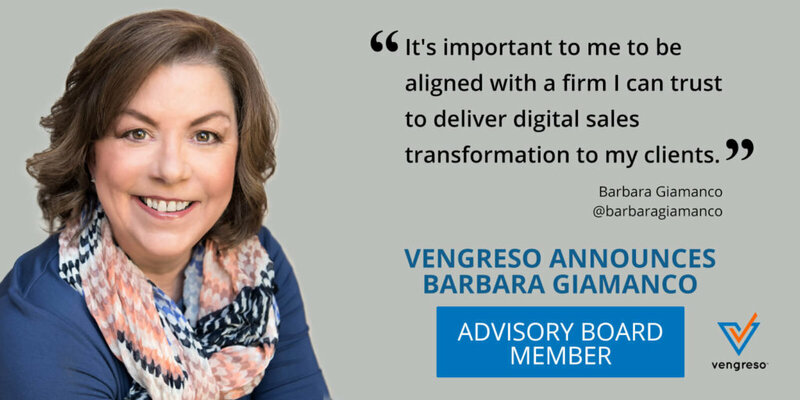 Giamanco joins Shari Levitin and David Meerman Scott on Vengreso’s Advisory Board and will be working closely with Kurt Shaver, Co-founder and Chief Sales Officer, along with the founding leadership team at Vengreso to drive Digital Sales Transformation within the sales and marketing community. “Barb is the original Queen of Social Selling. She has sat in the seat as a practitioner managing hundreds of millions of dollars’ in revenue for Fortune 50 organizations and has earned a seat at the table as a top sales influencer. I couldn’t be more excited about her embracing the Vengreso mission to help shape our focus, product roadmap and go-to-market strategies,” says Mario Martinez Jr., CEO and Founder of Vengreso. Additionally, Giamanco is the host of the popular Razor’s Edge podcast where she brings the world’s experts in business, sales, marketing and services to her listeners, along with her latest new podcast called Conversations with Women in Sales. She resides in the Atlanta, Georgia area.